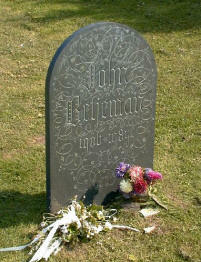 Sir John Betjeman is buried at St. Enodoc Church, Trebetherick, North Cornwall, England. His grave is located near the south side of the church. The church itself is approached via the 10th fairway of the golf course. Betjeman died in Trebetherick on 19 May, 1984. He had a lifelong love of Cornwall and in particular North Cornwall. There are many beautiful evocations of the Cornish landscape to be found in his poetry such as: Cornish Cliffs, By the Ninth Green, St Enodoc, Tregardock and Old Friends. At a time when many others poets were experimenting with free verse - Betjeman stuck firmly to traditional verse forms and rhyme schemes. However, the subject matter of his poetry was modern and accessible and it proved popular with the general reading public. His witty tone often led to him being dismissed by the critics as 'light-weight' - but beneath the surface his poems are often profoundly serious. The chilling poem Loneliness from his 1974 collection A Nip in the Air shows Betjeman's deep fear of death. Towards the end of his life, his belief in God waxed and waned. He also suffered nightmares about Hell due to the fact that he was married to one woman (Penelope) but lived with another (Elizabeth Cavendish). Betjeman was also a great champion of endangered architecture and an engaging TV presenter. He succeeded C.Day-Lewis as Poet Laureate in 1972. Larkin and Auden were both admirers of his work.